I am convinced that you can put almost anything (or almost nothing) on pizza, as long as the crust is perfect, and it will be great. Let’s face it, that’s the focus: the crust. How thick, how thin, how crisp, the flavor, the chewiness, the bubbles… a great pizza crust doesn’t need an excessive amount of cheese or toppings. Proportion is the key, and the crust is the foundation, focal point and probably the hardest thing to master. Pizzas are, of course, diverse creatures. How must a pizza be? If you’re from Chicago, deep dish is the only way to prepare the pie. If you’re from New Haven, CT, or New York, it’s thin crust all the way. 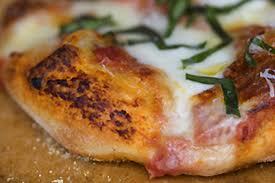 A lot of Italian restaurants, gastro pubs, and so on are doing flat bread pizza. They are all great. But, because I am from southern New England originally, I am going to stick with thin crust. But no matter what you choose, the crust recipe is the same. Before we get into the logistics of making a good crust, I want to mention that using a pizza stone in your oven is critically important. It holds the heat of the oven, providing an even-heated cooking surface. Pizza dough is, of course, bread dough. Its leavener is yeast, and the longer the fermentation, the more developed the flavor. It’s very similar to baguette dough. My recipe calls for 00 flour, which is a finely ground high gluten flour. It can be expensive and hard to find, so subbing with a very good quality high gluten flour will work. I also cut it with fine ground semolina, which add fantastic flavor and texture in the end. Give it time, let it slowly rise and develop over night. With a great crust, you won’t need to mask the flavor with a lot of greasy meats and cheeses. The crust speaks for itself. Place the flours in the bowl of a stand mixer fitted with a dough hook. In a small bowl, whisk together the water, sugar and yeast. Let stand until foams appears on the top. Add the liquid to the flour, turn the machine on low and run for about 30 seconds, or until the water is just barely mixer. Cover with plastic wrap and let sit 20 minutes. After the 20 minutes, uncover, add the salt and olive oil and turn the mixer back on, medium speed until highly elastic and smooth (about 10 minutes). Lightly oil a mixing bowl with a little more olive oil and transfer the dough to the bowl. Cover tightly and place in the refrigerator. Let sit over night. About 2 hours before baking, remove the dough from the fridge. Gently work the dough down, cover and let sit in a warm place until doubled in size. Cut the dough into 4 equal pieces. Dunk each piece into a little flour and semolina mixed together (the reserved flours) and work into a circle using your knuckles. You can also use a rolling pin. This step takes practice and patience. Take the time to really stretch the dough, without breaking. Form a nice crust, make sure it’s even, and thin. Heat the over to 475 with a pizza stone in the middle. Sprinkle some of the semolina/flour mix on a pizza paddle. Place the stretched dough on the paddle. Shake it a little to make sure it’s not sticking. Garnish the pizza dough in whatever way seems best (cheese, tomato sauce, basil, and so on). Slide the pizza onto the pizza stone and bake until bubbling, the crust is crunchy, and it’s completely cooked through in the middle. Remove, let cool slightly, and slice. Serve. My absolute favor pizza is smoked duck, brie, roasted red pepper, arugula and white sauce. Food for thought it guess, but it’s the suggestion that counts: be creative. This entry was tagged Bread, Crust, Pizza. Bookmark the permalink.